IF it is possible for a team to display both their greatest strength and biggest weakness in equally sharp focus in the same game, Celtic went close to doing it with this needlessly eventful victory. Ronny Deila’s men cruised into a 4-0 lead, which in no way flattered them, with some eye-pleasingly incisive football. 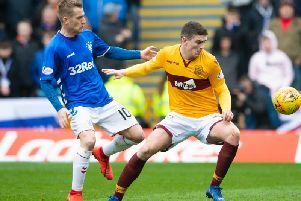 Their Dr Jekyll then gave way to Mr Hyde as an outbreak of brittle defending helped a previously outclassed Inverness Caledonian Thistle score twice to set up a relatively nervy finale to the contest for the Scottish champions. It was a day when the quality of Celtic’s midfield work gave new recruit Scott Allan, looking on from the main stand, an insight into how challenging it will be for him to nail down a regular starting place. It also underlined why Deila is believed to be prioritising defensive reinforcements during the remainder of this transfer window. Celtic’s season will be defined by success or failure in Champions League qualification but there was little consideration given to resting key players ahead of Wednesday’s first leg of the crucial play-off round tie against Malmo. With the exception of the suspended Nadir Ciftci and injured Kris Commons, Deila fielded what would be regarded as his first-choice starting 11. If the intention was to take care of this domestic business as expeditiously as possible, his players duly set about it in a purposeful and vibrant fashion to forge a 2-0 lead inside the opening 12 minutes. It was an Inverness line-up which appeared to have been designed with damage limitation in mind, given John Hughes’ decision to start the afternoon with his most creative talent, Ryan Christie, on the bench. But any hopes the visitors had of frustrating Celtic were extinguished in rapid order. The seventh-minute opener was simplicity itself, Stefan Johansen’s free-kick from the right nodded home from inside the six- yard box by Mikael Lustig as Inverness goalkeeper Owain Fon Williams remained rooted to his line. The Inverness defending was of the decidedly suspect variety again when Celtic doubled their advantage five minutes later. Nir Bitton jinked his way into space down the left before lofting a cross towards the far post. Danny Devine’s attempt to challenge Griffiths for the ball lacked any conviction, allowing the striker to direct a neat header beyond Williams from close range. Celtic showed no signs of resting on their laurels and Johansen was unfortunate not to make it 3-0 in the 24th minute, rattling the crossbar with a shot at the end of a slick move involving Griffiths and Lustig which summed up the fluid superiority of the hosts. Williams appeared vulnerable to every cross ball delivered by Celtic, although the Welshman did make a smart save to deny Griffiths after the striker had sprinted onto a fine through-ball from Emilio Izaguirre. Complacency posed the only threat to Celtic, such as the slackness from Dedryck Boyata that presented Inverness striker Andrea Mbuyi-Mutombo with a shooting chance which Craig Gordon touched over the top on the stroke of half-time. Hughes sent on Christie for Liam Polworth four minutes after the restart, but this already had the look of a situation beyond salvation. That impression was ratified when Celtic made it 3-0 in the 55th minute, Griffiths cutting the ball back from the left for Stuart Armstrong to sweep a right-foot shot high beyond Williams from around eight yards. Deila decided it was now safe to give a couple of his top men an early finish. With Malmo in mind, Brown and Lustig were replaced by Charlie Mulgrew and Saidy Janko. Any lingering doubts that the job was more or less done for Celtic appeared to be removed when Armstrong grabbed his second goal, seizing on Devine’s miscued attempt to clear and driving in a low shot. When Christie showed great composure to beat Gordon with a low left-foot shot in the 71st minute, it was regarded as no more than a consolation for Inverness. But they made Celtic endure a mildly uncomfortable final period when they pulled another goal back seven minutes later, substitute Dani Lopez taking advantage of more sloppy work from Boyata to drill a shot beyond Gordon from close range. Inverness were unable to make more of Celtic’s sudden loss of focus but Deila’s men can ill afford to display such defensive frailties when Malmo come calling. Celtic: Gordon; Lustig (Janko 62), Boyata, Van Dijk, Izaguirre; Brown (Mulgrew 62), Bitton; Mackay-Steven, Johansen, Armstrong (McGregor 70); Griffiths. Subs not used: Bailly, Stokes, Rogic, Forrest. Inverness CT: Williams; Raven, Draper, Devine, Tremarco (Lopez 68); Horner, Polworth (Christie 49), Tansey, Vigurs (Wedderburn 68), Williams; Mbuyi-Mutombo. Subs not used: Esson, Brown, Sutherland.